November has been a busy month for our Dance for Parkinson’s Class run by English National Ballet (ENB). 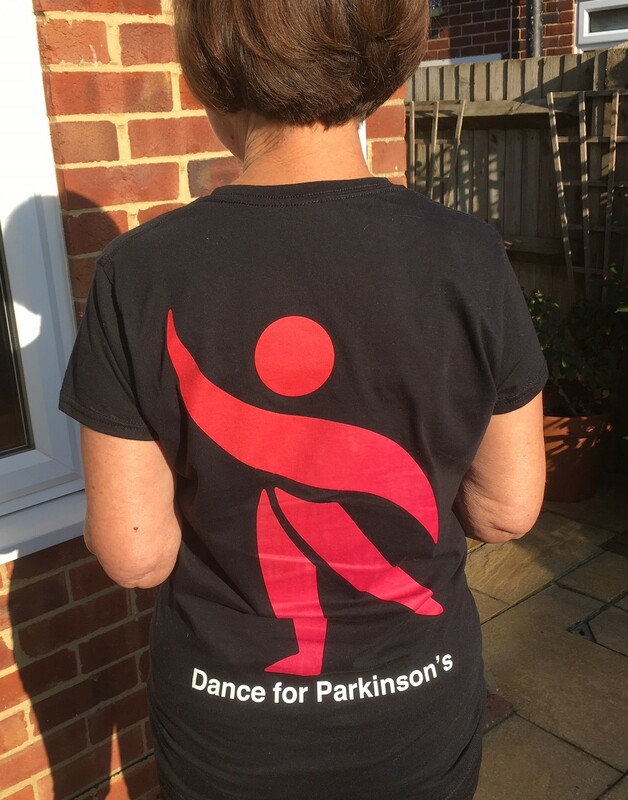 We were all surprised and delighted when we were given our own tee shirts with Dance for Parkinson’s on the back, designed by one of our talented members. Sizes seem to equate to tiny ballerinas. I may normally be a “small” size but needed a “large” for these! Recently we had a wonderful workshop led by David Leventhal from the Mark Morris Dance Group in the USA, everyone enjoyed the new challenge and rose to the occasion. One of the best things about all of these classes is that no one is excluded, adjustments can be made to enable everyone a chance to be a “dancer”. Classes in the historic Markova House, near the Royal Albert Hall, are coming to an end. ENB are building their very own centre in Canning Town which is due to open early in the New Year. However, the new site is a long way from where we are now and folk with Parkinson’s tend not to like change or want longer journeys. What will happen next we will wait to find out. There may be an opportunity for a monthly class in the Royal Albert Hall. Our last class here will be in mid December and we’ll party afterwards! Later that week the group will go to see “The Nutcracker ” at the Coliseum. A busy month too for the choir (“Good Vibrations”!) as they prepare to entertain the members of the local Parkinson’s UK at their monthly branch meeting; we have several jazz songs for the occasion from “I won’t Dance” to “Besame Mucho”. We are also singing at a Christmas Tree festival in a nearby village church. We sang there last year, we must have done well enough to be asked back again! The building is beautifully decorated with sparkling, glittering trees from various local groups. Not much really to report on my actual Parkinson’s except after 6 years of no health issues whatsoever I have succumbed to a chest infection and hacking cough which has taken a long time to go. I must need some sunshine, we are back to Australia in January! Before that though Handsome Henry, now a very active toddler who wants to climb everywhere, is coming back here for Christmas, exciting! Hide the China! What a busy time you’ve had in spite of the cough. Well done, I’m sure being positive makes all the difference! See you soon. Have just opened my e-mails and found your latest blog. Of course it was much nicer to have you tell me your news in person yesterday!!! Thankfully, after a very disturbed night, John is back on track again. We are so sorry we had to leave early. You still look great and I meant to ask you about your consultant and about the Duoro trip. Next time maybe. Have a wonderful Christmas with Laura and Henry.